A bronze incense burner in the form of an elephant, standing foursquare with its head turned back and its trunk curled between the tusks. The separately cast, openwork cover is decorated with bunched lotus flowers. The elephant wears a howdah engraved with lotus flowers and is richly attired with caparisons composed of ‘jewelled’ straps and tassels. The rim of the cover is engraved with a six-character mark of Xuande (Da Ming Xuande Nian Zi). The elephant’s fittings were originally inlaid in semi-precious stones. The elephant (xiang) is known to have existed in China during the Bronze Age. Proof that the animal was a popular subject in art from very early times is provided most spectacularly by a large Shang dynasty zun (12th – 11th century BC) in the form of an elephant in the collection of the Musée Guimet in Paris. The elephant became extinct in China soon afterwards, but the animal’s enduring popularity as a decorative motif symbolising strength and high moral standards2 is evident from the many extant representations in practically all available materials in Chinese art. A richly caparisoned elephant is often seen in the presence of the Emperor, either as a bearer of tribute gift or as an exotic animal in the Emperor’s menagerie. The hollow body and the openwork cover suggest that this bronze elephant was designed as an incense burner. Although the cover of the present incense burner is engraved with the six-character mark of the emperor Xuande, who reigned from 1425 to 1435, the piece is unlikely to date from that period, but the compactness of the animal and the fine detail of the casting certainly suggests a Ming dynasty date, albeit of a somewhat later period. A similarly detailed bronze elephant censer in recumbent position, dated to the 16th century, is illustrated by Hausmann. 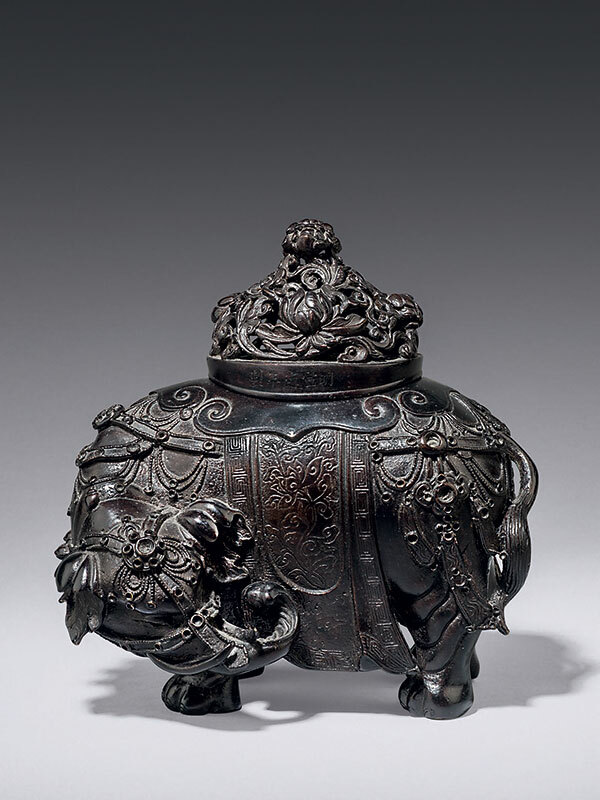 There are some comparable bronze elephants with a zun vase on the back, probably used as a candleholder: one with simple decoration and dated to the Song dynasty (960 – 1279) onwards is in the collection of the National Palace Museum, Taipei;4 an 18th century piece similar in the design and the depiction of the elephant is in the collection of the British Museum;5 and a further comparable pair of bronze elephant vessels, also dated to the 18th century, is in the Robert E. Kresko collection.